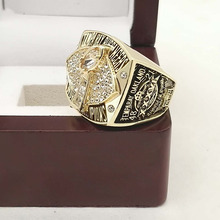 The 2002-2003 Tampa Bay Buccaneers Super Bowl ring come with a wooden gift box. This gold themed ring features a large football in the center, which is encrusted with high-quality cubic zirconium crystals. At the top "Tampa Bay Buccaneers" stand out in raised gold with a black inlay. At the bottom "World Champions", also in raised gold with a black inlay. Popping out above everything is a raised gold Super Bowl trophy, with faux diamond features. Everything on this side appears in raised gold lettering. "Tampa Bay 48" and "Oakland 21" tops this side. Centered below, a design which reads "Super Bowl XXXVI". "San Diego California, January 26, 2003" appears next. At the bottom, an NFL logo finishes out this side. "Jackson" shows up at the top of the other side. It appears on a raised gold banner and the lettering is engraved onto that. A palm tree runs up the left side and appears with a few other designs. Everything in raised gold.